On 24 August, China Power International Development Limited entered into a strategic cooperation agreement with Longji Clean Energy Company Limited in relation to the photovoltaic “grid parity” demonstration base project in the company’s office in Hong Kong. 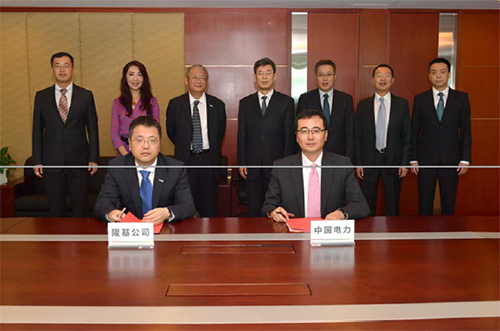 In the presence of the Executive Director and President of the company Tian Jun and the President of Longji Company Li Zhenguo, Yang Yufeng, the Chief Economist of the company, and Zhang Changjiang, the Chairman of Longji Clean Energy, signed the agreement on behalf of both companies. Before the signing ceremony, both parties engaged in in-depth exchanges of their work. Tian Jun welcomed the visit of Li Zhenguo and his colleagues, and truly recognized Longji Company’s commitment to its mainstay, determination to innovation, and its established reputation in the industry. The company will continue to develop clean energy, allocate more resources to the development of photovoltaic projects, said Tian Jun. He hoped both parties can leverage their own advantages to deepen strategic cooperation, reduce costs and enhance quality and efficiency for the photovoltaic industry in order to promote a healthy and orderly development of both companies. Li Zhenguo introduced the current development and future growth plan of Longji Company. With continuous advancement of photovoltaic technology and gradual reduction in electricity cost, the competitiveness of photovoltaic power will be enhanced, said Li Zhenguo. Capitalising on its own advantage, Longji Company will cooperate with China Power and proactively make application for photovoltaic “grid parity” projects in order to realize mutual benefits. The heads and relevant staff members of the strategic planning department of the company and Shenyang Energy Investment attended the signing ceremony.